What we have here is a bunch of knowledgeable, well intentioned people how aren't familiar with dealing on the web. Really? We're all a bunch of newbie World Wide Web bumpkins. You picked a scrum with Bob and now you're insulting all of us. I've run thousands of plagiarism checks and I would never ding one of my engineering students over two sentences of basic historical fact, regardless of where it came from. The Dean would laugh me out of his office. Bob even did a little editing. Highway 395 is now open, according to Nevada DOT and Caltrans. Conditions are being closely monitored by NHP and CHP. My dad used to tell me to not believe everything I read in the newspapers. After a few years working in communications intelligence in the USAF and later in civilian life, I came to understand how right he was. The media, in whatever form it takes, is always to be regarded with suspicion. We are responsible for checking the facts as far as we are able, and then perhaps question our own assumptions. "If you don't read the newspaper, you're uninformed. If you do read the newspaper, you're mis-informed." — Mark Twain (Supposedly). Ironic that he said this under a fake name. His real name is Samuel Clemens(1). I made my statement in the context of a discussion of people who are too trusting of Wikipedia. I can't imagine applying it to "all" here. That is the kind of complete misrepresentation of my position that you have made here before. However, if you think my statement does apply to you personally: "If the shoe fits, wear it." Then if you still feel insulted, remember that the fit was your choice, not mine. I'd be happy to ask your dean personally if it is the position of his institution that "a little editing" is the appropriate response to and resolution of cases of plagiarism discovered in her/his institution. Jeez Louise, people. I'm sorry I posted anything about the 395 closure. Can we just put this thread (and unpleasantness) to rest? Why don't you show us a Dean at any college that would accuse a student of plagiarism for pasting 2 edited sentences about a common knowledge, recent historical event, with 1,000 possible sources besides Wikipedia. Maybe a 9th grade English teacher trying to make a point, or if this were a pattern throughout a paper, but not by itself. No way. And don't forget, this is a hiking forum, not a university. Please chill out, Dale. Nobody is going after you, we just don't care about copying 2 sentences stating historical fact on a hiking forum. While all of this discussion was going on, they opened the road. That's good. I'll be going down it next Saturday on my way to Whitney. Live in the Bay Area so I have several options though (like going through Yosemite on hwy 120 or doing the end around via Bakersfield). 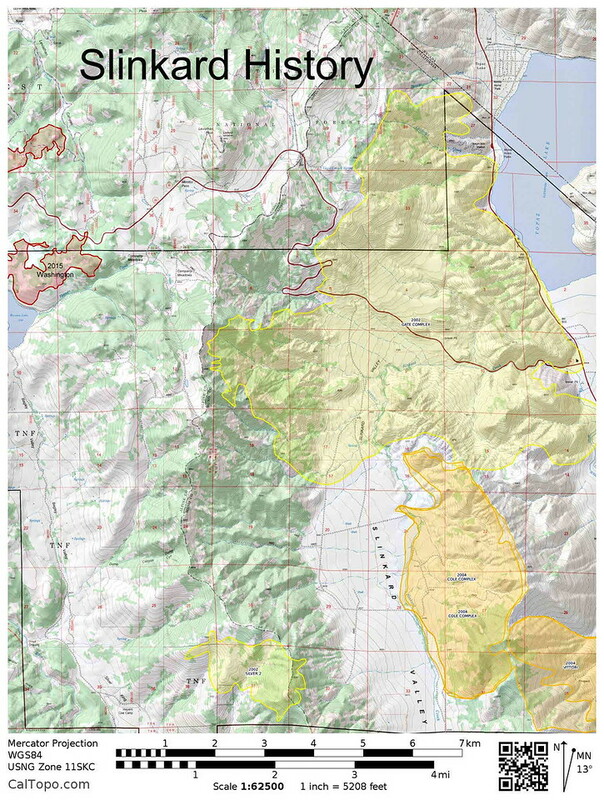 "Yesterday, Highway 395 was closed temporarily for fire suppression efforts." "Highway 395 is open. Highway 89 over Monitor Pass remains closed due to fire activity. Motorists traveling on Highway 395 are reminded that there will be large amounts of holiday, fire, and Burning Man traffic. Please drive with additional care." CA 89 over Monitor pass is still closed though. Big fire on the other side of the pass at the 89/4 junction a couple years ago. Seems like this area burns pretty darn often. I drove home through the area yesterday. 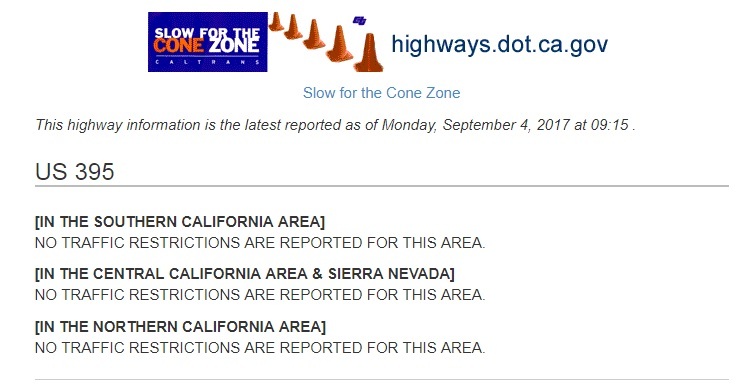 Zero fire-related problems, just insane holiday (and Burning Man) traffic. The fire burned to the edge of the highway which effectively became a fire break. ... Seems like this area burns pretty darn often. 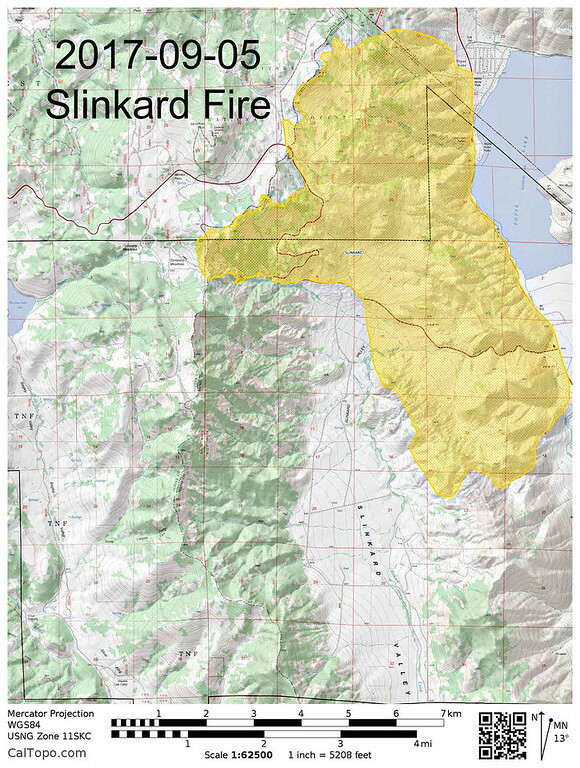 The last close fire was the 2015 Washington Fire. I had to wait until it was out to work on fish in Slinkard Creek that year. Some people just love to crank up the dynamic here: no response without escalation. "we just don't care about copying 2 sentences stating historical fact on a hiking forum." That would have led to a far different tone, but some people aren't satisfied by calm disagreement. - "We're all a bunch of newbie World Wide Web bumpkins." - "The Dean would laugh me out of his office"
-"Chill out" "Nobody's out to get you"
-and in a ironic reversal: "And don't forget, this is a hiking forum, not a university." It's as if someone were afraid that without his help our attention would wander from this hiking site to Jerry Springer or the news. Dale, did it ever occur to you that people are not after you, but they simply misunderstand your posts? You tend to include multiple quotes and subpoints that take a conversation into several directions. You have lots of information to contribute, but it gets buried in all that. For example, go back over how you responded to Steve after he called you out for accusing Bob of plagiarism. You responded to Steve with a quote and reaffirmed your accusation. Then another quote and lecture about the history of the phrase "shoot the messenger." You also included quotes and complaints about Wikileaks. To top it off, you included a link to a poem about the blind man and the elephant. All that in one post can lead to confusion for others. I'm not going to dignify your ridiculous accusations about me with a response at this time. Steve's probably too busy to babysit this thread, but most moderators would be telling you to chill out about now. Generated in 0.180 seconds in which 0.170 seconds were spent on a total of 15 queries. Zlib compression disabled.